On the rare occasion, as a kid, we went to TGI Friday’s for dinner as a treat. My mom would order the warm spinach salad and I had a chicken quesadilla (exciting!). To this day, I distinctly remember that salad being really strange. Why on on Earth would anyone want to eat a pile of spinach with raw mushrooms and warm dressing?! After spotting some good-looking spinach at the market recently, I was in the mood to create an autumn-inspired salad. Normally, I buy organic baby spinach in the bag. It’s tender, always available, and super easy to add to any meal. But the spinach I found (sans bag) was a deep, mesmerizing emerald color- I had to have it. I asked around to see if anyone knew the variety. For the dressing, applewood smoked bacon and onion are sautéed until soft and golden. This is the base. When finished, I drain off some of the oil (I have a penchant for smoky bacon drippings- try it potato salad!) and add apricot jam, whole grain mustard and just a splash of apple cider vinegar. The flavor is smoky, tart and sweet, but don’t sample while it’s blipping away- you’ll burn your tongue off. You can even make the vinaigrette in advance and warm gently before serving. For the salad, ‘greige’ fungi are replaced with acorn squash. Much prettier, right? The squash gets all golden and sweet, and happily drinks in the rest of the flavors. And finally, for the apples, I’m using a new-to-me variety called, ‘Envy.’ They’re from New Zealand originally, and I picked up a few this week at Trader Joe’s. They taste similar to Gala apples (sweet, not tart) but with more crisp to the bite. Crumbled stilton, thinly sliced red cabbage, and crispy bacon complete the dish. Do you have any childhood food memories, reinvented? 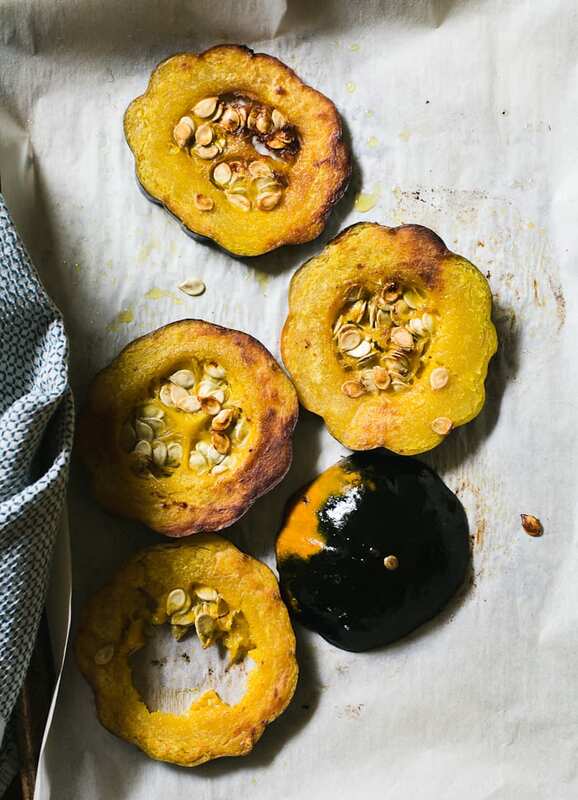 When roasting acorn squash, leave the seeds attached instead of scraping them out beforehand. The seeds add flavor, and they’re easier to remove once the squash is soft. So is the outer green skin. I buy applewood smoked bacon that comes stacked (as opposed to fanned out) in the package. Try this tip: cut off about 1/3 of the stacked bacon (still in the package) which amounts to a few regular slices. Then, freeze the rest. This way, you don’t have to commit to making the whole package of bacon at once. For extra crunch, make a batch of these pecans and scatter a generous handful over the top! Preheat your oven to 400 F. Line a sheet pan with parchment paper. Add the acorn squash, coat with olive oil, and season with salt and pepper. Roast for 20-30 minutes until golden brown and tender. When cool enough to handle, remove the seeds and peel off the outer skin. Chop into 1-inch pieces. For the dressing, add the bacon to a non-stick pan. Saute over low heat until golden. Transfer to a paper towel lined plate. Drain off most of the oil leaving about 2-3 tbsp. Add the onion to the pan and sauté until soft. Add the apricot jam, mustard, and vinegar and stir to combine. Taste (don’t burn yourself), and adjust with additional vinegar and/or oil, as needed to make enough dressing for the salad. Set aside until ready to serve. For the salad, add the spinach, cabbage, and red apple to a bowl. Add the squash. Pour the warm dressing over the top (reheat if necessary) and toss gently. Crumble the stilton over the top. Yeah, I’m going to go out on a limb and say that much of my childhood food has been reinvented :o but actually my Mom (parent of 10) used to make an Asian spinach salad that I was so proud of – I always thought it was super fancy as a kid – funny the things we remember (and those we wish to forget). I love how you made your dressing in a skillet – I’m going to try that. 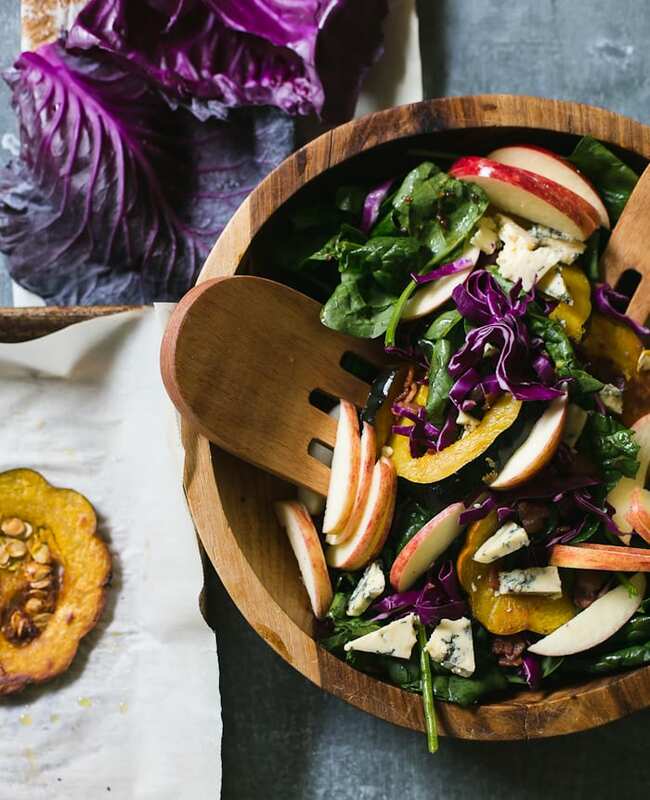 Such a beautiful fall salad Emilie – it’s bringing me the biggest smile just looking at it. The combination of blue cheese and fruit always draws me in. Emilie, beautiful salad. I unfortunately am unable able to have blue cheese so I am thinking of trying shaved Parmesan. I hope this works as well. So happy I found you . I enjoy following you and your gorgeous food. Envy apples are my FAVORITE! They sell out quickly around here so when I find them, I grab 2 bags. That salad looks so good! I’ll have to try this one. I’m in the mood for winter squash these days. I used to be just the same – didn’t really get the point of a warm salad – but thankfully, my taste buds have evolved over the years as well, and I’m now SO ready for all the heart-warming salads I’m going to have this fall. And this recipe looks so delicious, so it definitely needs to be one of them! This salad looks delicious! Love the dressing. Yum. 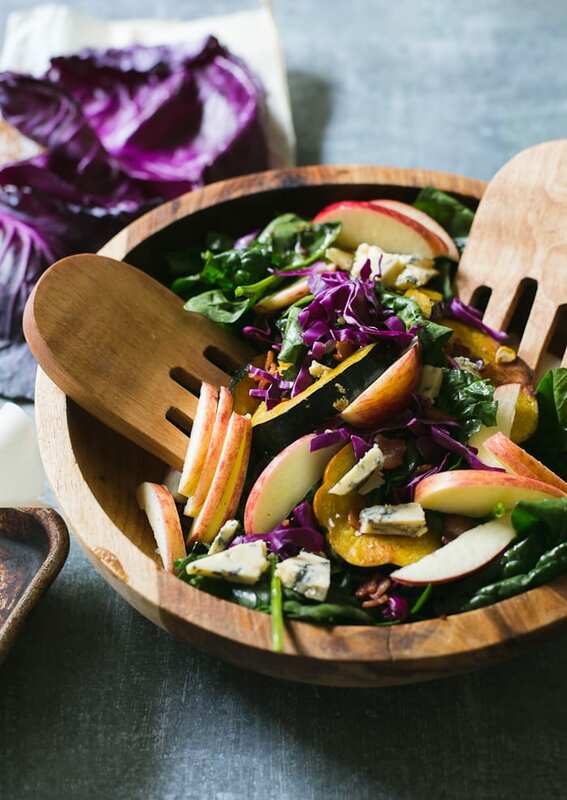 Apples, squash and spinach a perfect combo for celebrating fall favourites. Thanks. Oooh, I love this salad! Must try make the dressing it looks soo interesting! This is such a gorgeous fall salad. Aren’t Envy apples the best?! I alway enjoy your repcieces and the visuals are always so wonderful to look at! really creative dish! thanks so much, have similar memories of that place – nachos with jalapenos, remember thinking who could ever like anything so spicy, as you wrote, tastes evolve!